Solar power is today’s leading alternative source of energy. Although the sun has always been providing free energy to Earth, we didn’t develop the technology to harness such an abundant resource until relatively recently. We now use photovoltaic (PV) cells to convert solar radiation into electricity. On average, solar cells only translate 15% of the radiant sunlight they catch into electrical currents. In other words, the remaining 85% is wasted. With the discovery of colloidal quantum dots, however, things can change for the better. They are a new kind of light-sensitive nanoparticle, with potential to be more efficient for solar cells. They’re designed with semiconductors that can actually maintain their stability outdoors. Green Air Heating and Air Conditioning believes another newly discovered material is likely to take solar technology to new heights: gallium arsenide. Any solar panel company that understands it expects it to triple the efficiency of PV systems. Before the invention of molten salt storage technology, the unused electricity generated by PV cells would get lost shortly after the sunset. This breakthrough allows solar plants to operate at temperatures more than 932 degrees. This could prolong the life of solar power, making it useful beyond meeting peak demand during daylight hours. Scientists are developing the next generation of PV systems with thin film cells made from magnesium chloride. Available in seawater throughout the planet, its bottomless supply promises to drive the cost down. If it’s as good as expected, any savvy solar installation expert knows that it could also boost solar-cell efficiency by up to 15%. The future is bright for solar power, but the time to adopt it is now. 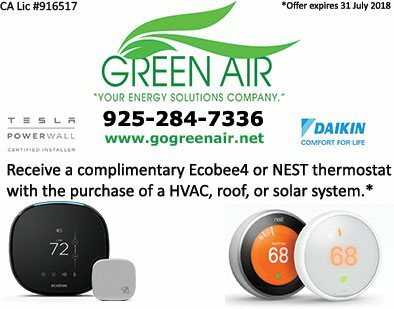 Call Green Air Heating and Air Conditioning at (925) 62-SOLAR now to get a free estimate for your PV system. We serve homeowners in Oakland, California, and the surrounding areas.